Two-Factor Authentication (TFA/2FA) is an extra layer of security that allows you to keep your account secure even in the event your password is compromised. By configuring your GMS account security with your mobile phone, you can then verify your identity using a randomised code sent to you in SMS format. How do I set up 2FA in GMS System Administration? An admin user can enable Two-Factor Authentication by checking the box found under Account Security in the Priveleges section of the Profiles dropdown menu. How do I configure 2FA in my Webspace account? 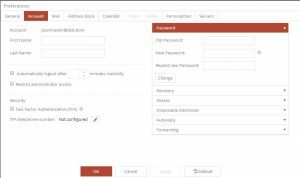 Once admin has enabled Two-Factor Authentication, the user will be able to turn it on and off from their Webspace account preferences. In order to configure 2FA correctly in Webspace, a user needs to enter the telephone number of the mobile device with which they would like their account verification SMS to be sent. Country dialling codes can be selected from the dropdown menu with the number itself entered thereafter. Once a valid number has been added, a verification code will be sent in SMS format to the number provided. The code can then be entered, completing the configuration process. The next time the user logs in to their Webspace account a verification code will be sent to the configured telephone number, the code must then be entered in conjunction with the user’s username and password in order for them to access the account.